Apparently I’m really taking my personal goal to paint more this year to heart. 🙂 I haven’t been able to put away my watercolors lately and I have so many ideas for various projects involving watercolors I have started a list in my journal. Quite honestly? It’s therapeutic. And I don’t need good weather (because Lord knows THAT’s in short supply!). And it doesn’t require sanding or heavy lifting. Just a seat at my kitchen table and a cup of water. How awesome is that? Y’all, I can’t even describe how much I love this. 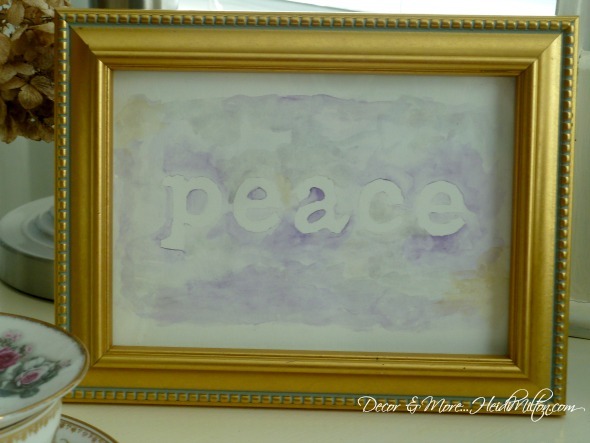 I completed this project on a snowy afternoon… talk about peaceful!! 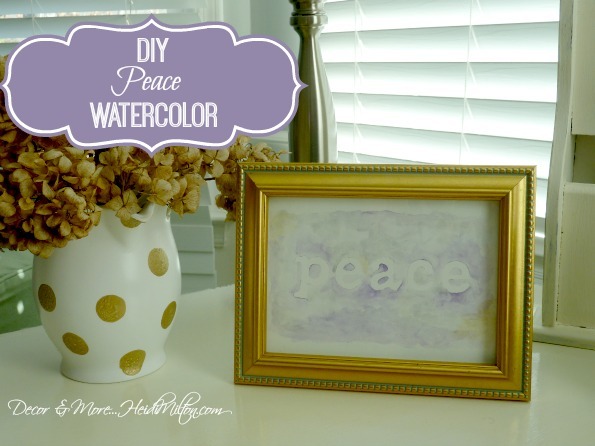 Here’s how… I came across a package of these Thickers that I’ve used on other projects, and they provided the perfect template for the word peace. You can find these at your favorite craft store, too. The great thing about using them as a template is that they’re reusable. The adhesive is just strong enough to keep them in place, but won’t damage the paper when you pull them off and restick them to their original sheet. I simply traced around the letters with a pencil. 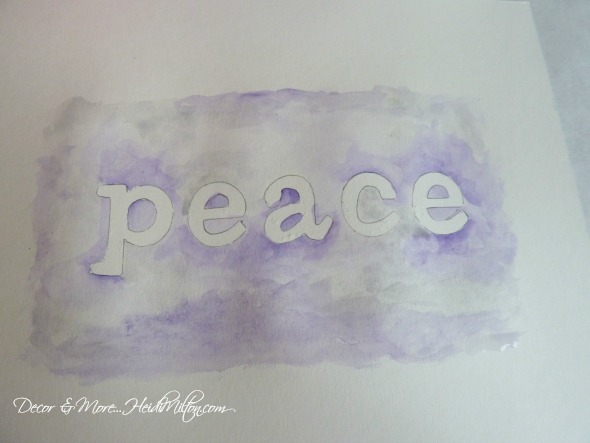 I knew I wanted this for my Mom Cave, so I chose purples and grays to begin painting around the outside of each letter. 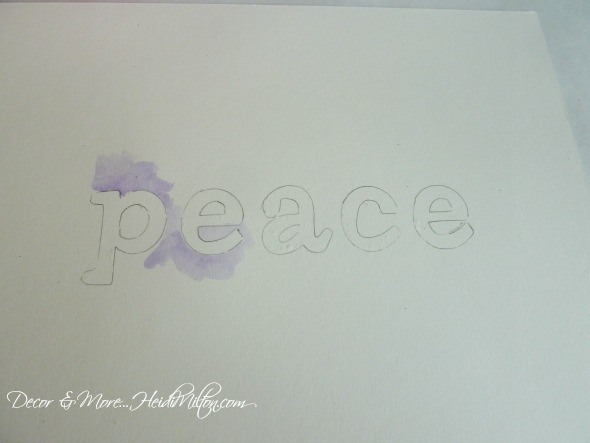 When I created my watercolor initial project, I felt that the color was too saturated in a couple of places at the edge of the letter, so it began to look more like an outline. So this time, I kept the color very watered down and spread it out more quickly to keep it from being too dark. 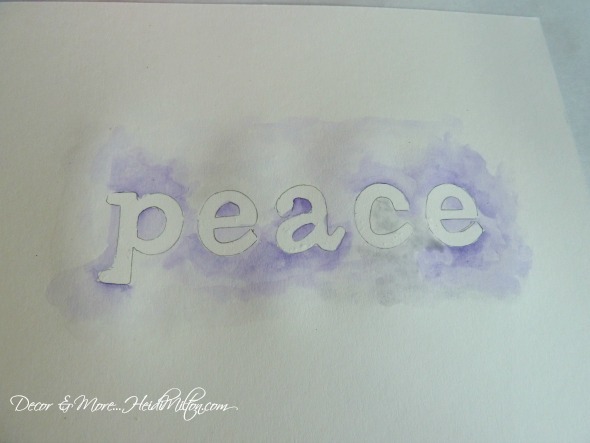 I tried to balance out the areas where the purple was a little darker — bottom of the “e”, inside the “a”, top of the “p”, etc. Then I went back and filled in with lighter lavendars and some gray. Notice you can still see the pencil marks. That’s OK! 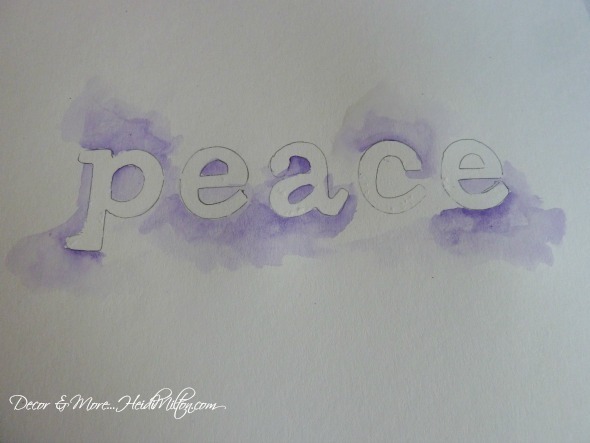 I just kept fanning out the purples and grays to form a nice airy border around the word. I was guessing this would fit in a 5 x 7 frame at this point. I had a gold frame in my stash and since I’m adding a few gold touches to the Mom Cave, I added just a hint of goldish watercolor in a couple of places. I let this dry thoroughly — a few hours since the paper gets pretty wet as you work. When I was certain it was completely dry, I erased all my pencil lines. Now you just see the letters outlined in paint! And I have a lovely reminder of my Word of the Year right there on my desk, where I see it and enjoy it every day. This project lends itself to loads of possibilities — different words and simple phrases. I’m already pondering gifts to give and possibly one or two to go in my booth. Ok, so have I convinced you to get your watercolors out?? This weekend I’m hopefully wrapping up a headboard project I started a while back and getting some work done in my yard. We’ve got a couple of nights out with friends planned, too, so it will be busy, but with all the good stuff. I hope your weekend is full of good stuff, too! PS — Yesterday I posted at Mohawk Homescapes Five Ways to Brighten for Spring! Check it out and share your ideas in the comments! i love this and i see myself making these as some christmas gifts. great concept! Jennifer @ Decorated Chaos recently posted..Ballard Inspired Memo Board & Giveaway Winner! Very pretty 🙂 My husband and I are going to the Georgia Aquarium tomorrow and I am really looking forward to it. We haven’t been in about 7 years. I hope you enjoy your weekend adventures! I love this, Heidi…love the serenity of it. Well done! So very beautiful Heidi…I took a watercolor class and was only able to go to the first session as they moved it to a day that I was already committed to each week…so hopefully I can try again…you must love to do that as it shows!